Read along to find out more about Kenji and what he’ll be working on at Payara. Welcome to the Team Kenji! Tell us a little bit about yourself – where are you from, what’s your background, what you specialize in? I was born in Tokyo, Japan. There were a lot of architects in my family, so at the graduate school, to follow the tradition, I decided to study air conditioning of buildings. At the same time, since childhood, I was always very interested in programming and sometimes I would give lessons to my classmates on C programming in a class, instead of our professor. So finally, I started working as a software developer because my programming skills were recognized by the Japanese IT industry. However, within 7 years of working as a developer, I became a bit discouraged with a very strict and non-forward-looking approach practiced by the companies I worked for. My turning point was when I met Yoshio Terada - the most famous Java EE evangelist in Japan - who taught me about Java EE and GlassFish. I was very lucky that Yoshio wasn't very well-known in the industry at that point yet, so he had time to teach me everything from A to Z! Yoshio invited me to a JUG established by the Sun employees called GlassFish Users Group Japan - and not long after I became a core member of the group. After GlassFish was transferred from Sun to Oracle, I became the leader of the GlassFish UG. Then, when Oracle decided to drop commercial support for GlassFish, and Payara Server started getting more popular, the GlassFish User Group Japan members got very interested in it and many of them started migrating from GlassFish to Payara Server. After growing a relationship with Payara via my user group leadership, we held a very successful Payara Meetup event on the 6th of June 2017 (see more). Now the user group has grown, we have over 270 members, making us the fourth-largest JUG in Japan. What is your role at Payara? I am a Service Engineer. As an Engineering Team, we solve various customer problems and respond to GitHub issues, questions raised on the Payara Forum, Stackoverflow etc. - all to help the Payara Community. Writing technical documents is also our important task - I'm going to focus on translating our technical documentation, blogs and marketing material into Japanese language to make it easier for the Japanese users to adopt and use Payara Server. How did you first hear about Payara? When I first heard about Payara around 2014, I was quite disappointed with the GlassFish roadmap announced by Oracle and frustrated about stagnation of the GlassFish community - I was worried that the things were getting worse. At the time, Payara Server 4.1.144 was released and I remember that I was absolutely ecstatic about it! I saw the energy coming from Payara which reminded me of Sun's GlassFish that I loved so much. I believed GlassFish was reborn into Payara Server. Since then, I started recommending Payara Server not only to the existing GlassFish users but also to the new Java EE developers. What made you go that extra step to actually consider working for Payara? 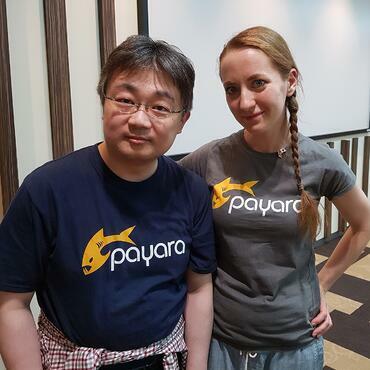 Loving what Payara was doing with GlassFish and development of Payara Server, I naturally started promoting Payara Server and Payara Micro and became a Japanese Payara community evangelist. This was noticed by the Payara Team who reached out to me and we developed a relationship to grow the community in Japan together. Then the opportunity came up to apply for a job at Payara so obviously I couldn't miss it! Working for Payara also gives me an opportunity to re-connect the Japanese server-side Java engineers with Java EE and increase their interested in it, so they don't have to move off Java EE for no particular reason! Is there anything you’ve found out about Payara in your first couple of days here that you’re especially excited about, something that you’re looking forward to work on? Payara is a worldwide company - the team covers Europe, America and Asia, therefore we can connect to all time zones and offer 24/7 service for customers. Needless to say, Payara is a very active OSS project, relating to many developers and community users. Just before I joined Payara, Steve Millidge, the company Director, became a member of EE4J PMC - we can now shape the future of the Enterprise Java - it's so amazing! I'm extremely happy to be a part of this historic moment. Are there any projects you like to get involved in outside of your day-to-day job? I'm interested in learning about the various fresh and exciting technologies and I like to share them with others. I'm a JCP associate member and have been an observer of JSR 310 - Date and Time API - since its early times to its final release. Thus, I act as an evangelist of Date and Time API in Japan and I like to present talks about it here and there (e.g. here). I also introduced MicroProfile 1.0 to the Japanese community and presented at the Oracle Code Tokyo. Any personal blogs or social media profiles you’d like to share with the community? Have a look on my personal blog , and I'm on GitHub as khasunuma, I'm also on Twitter. For other links, have a look at my website.